Double life-saving intervention in the afternoon of today, 30 January, for the Air Force's aircraft. The first saw the activation of a HH139 helicopter of the 85 ° Research and Rescue Center of Pratica di Mare (CSAR) in favor of a man suffering from severe illness in Ponza. 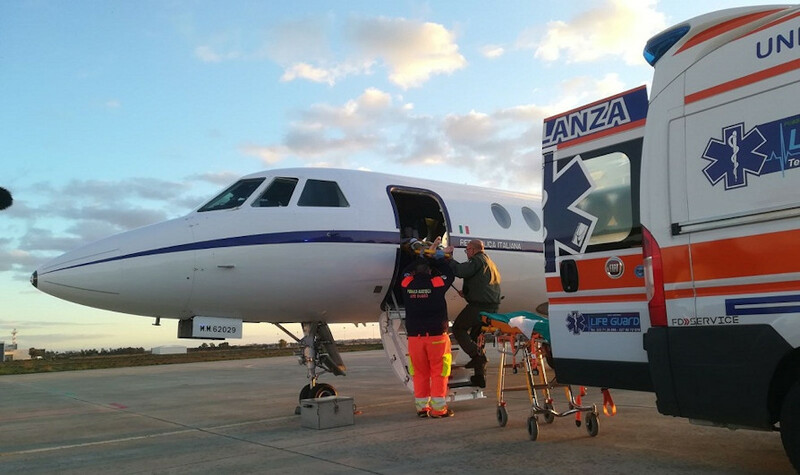 The second intervention instead took place on the Lamezia Terme-Ciampino section in favor of a girl transported with extreme urgency on a Falcon 50 aircraft of the 31 ° Stormo of Ciampino. The HH139 intervention, requested by the Latin prefecture, ended around 16: 20 hours this afternoon. The man transported, of 56 years, has been caught by a serious illness on the Pontine island. The serious conditions and natural difficulties related to the time necessary for moving from the island to the mainland, have made the intervention of one of the Armed Force assets in constant operational readiness fundamental. When he arrived in Latina, the patient was immediately transferred to the Santa Maria Goretti Hospital. A few hours after the first aid, on activation of the Prefecture of Catanzaro, the second transport was also completed, this time in favor of a woman of 21 years in need of being transferred from the Hospital "Pugliese - Ciaccio" (CZ) at the Gemelli Polyclinic in Rome. The young woman, accompanied by her mother and a medical team, arrived at Ciampino around 17: 00, and was immediately transferred to the Roman hospital by ambulance to receive the necessary specialist care. Both missions were managed by the Summit Situation Room of the command of the air squad, the Armed Forces operational room that also deals with the coordination of this kind of missions in favor of the community.